We are a small family run Arboricultural business that was started in 1960 by Derek Clark. John, son of Derek entered fully into the business after 3 years at Merrist Wood College obtaining an OND Arboriculture. Derek Clark retired from the business in July 2012 at the age of 84, after over 50 years of trading. 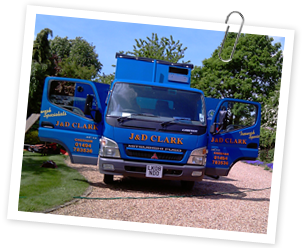 J & D Clark is now owned and managed by John, with the business becoming a limited company in May 2014. In the mid eighties we attained the Arboricultural Association Approved Contractor status. To maintain this our business is vetted every 2 years, with all aspects being appraised, from office procedures to quality of work. With inspections of tree surgery, tree felling, dismantling, crown thinning and tree planting. During this inspection a broad professional knowledge has to be demonstrated. Insurances, qualifications, health and safety certification as well as checks into the implementation of all legislation a small business of our type has to adhere to. For more information on the Aboricultural Associations Approved Contractor scheme, and standards required, please click on the link. J & D Clark Treework Specialists simple aim has always been to provide our customers with a top quality arboricultural service, for tree surgery, tree pruning, tree felling, stump grinding, hedge cutting and tree planting and provide the best tree work possible. Our tree care business has developed over the years becoming larger, better equipped, highly efficient and environmentally conscious. We process all our branch debris through specialist wood chippers capable of producing a consistent quality chip. This enables J & D Clark to send the majority of our tree felling and tree surgery waste to power stations where it is used for renewable energy. J & D Clark Treework Specialists only use vegetable based chain oils, this prevents environmental contamination from the total loss lubrication systems of chainsaws. We have a comprehensive environmental policy which outlines our methods/processes for minimising J & D Clarkâ€™s impact on wildlife and other countryside issues. Wildlife and Countryside Act 1981 as amended EC Directive on the conservation of wild birds 1979. EC Directive on Conservation of Natural Habitats & Wild Flora & Fauna 1992. EC Directive 2000/60/ECWater Framework Directive. The Protection of Badgers Act. English Nature Bat mitigation guidelines 2004. A full copy of J & D Clark's Environmental Policy can be supplied if required.